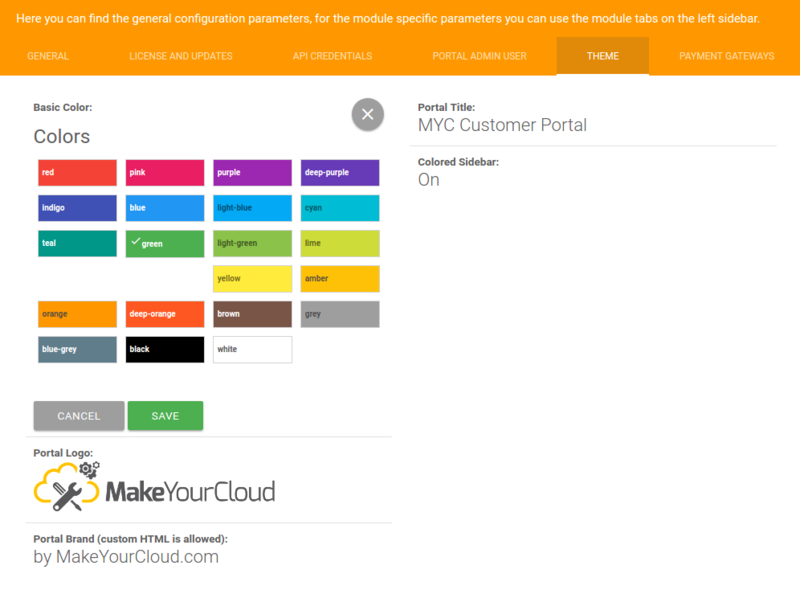 Basic Color: This is the basic color used all around the MYC Portal, simply choosing your favourite color from the list will change the following elements in the theme: Links Colors, Header Navbar Colors, Primary Buttons colors, Dashboard Widget colors etc., it will apply to all the portal graphic elements that make sense to have a custom color. Portal Logo: This is the main logo used for your MYC Portal, it will be shown all around the portal public area and the login form. Portal Brand: This is the text shown at the bottom of the login box and in the portal footer, it can contain your organization copyright info, a custom slogan to show your customer or a link to your website. Portal Title: This is the title shown in the browser tab title when you navigate in the portal platform, we suggest you use a descriptive title like "MyBusiness Support Portal" or "MyBusiness Sales Portal" etc..